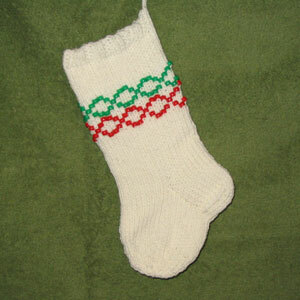 The December/January pattern for Six Sox Knitalong was revealed on Wednesday. Hmmm... Beads. I don't want to have socks with beads and nobody I know wants to have socks with beads. So what do I do? Enter the assorted Pony beads I bought for my braids, some leftover bulky acrylic yarn, big dpns and a small crochet hook. Voilà! A Beaded Christmas Stocking. As I need two stockings, it will fulfill the requirement of a pair too. Problem solved. Since I did not have enough beads of any one color, I had to get creative with colors. I like how the red and green crosses form two garlands around the stocking. I cast on 40 stitches, knit 4 rounds of 2x2 rib, 11 rounds of stockinette and used a 2.5mm crochet hook to attach the beads. The crochet hook method instructions have been posted to the list and on various blogs, but I'm going to repeat them for future reference. This method is very simple. You put a bead on the hook, pull a stitch from the left needle through the bead, replace the stitch to the needle and knit it. Done. In essence you are adding the bead to the round below the one you're knitting, so you have to take that into account when calculating row gauge. When the bead pattern was done I knit 20 rounds, made a square heel without gussets (knit 12 rows of heel flap instead of 20), picked up 7 sts on either side of the heel, knit another 15 rounds and made a round toe. Now I just need to make another and call it a pair. The other one is going to be gray with black and white beads, because I don't have enough white yarn or the red and green beads left. They are going to be fraternal, but since when Christmas stockings had to match?